FIVE THINGS YOU SHOULD KNOW BEFORE YOU PAY A REAL ESTATE AGENT 6% TO SELL YOU HOME. 1.) There is no difference between any real estate company and 3% Real Estate's ability to sell your home. Whatever they have, we have - except the gimmicks. 2.) No matter what any agent will tell you, 3% Real Estate's homes sell as quickly and for the same price as any comparable home listed by any other agency. You will net more, however, because of our reduced fee. 3.) And no matter what they say, agents show and sell our homes. 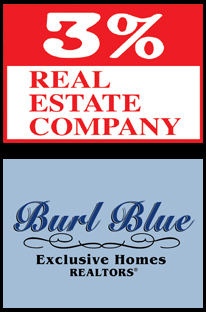 The vast majority of our homes are sold by agents from other companies. The only agents who say that they only show homes that pay them a 3% fee are unethical agents. Do not do business with them! Besides, many of our homes pay the other agent a 3% fee - the owner makes the call. 4.) Gimmicks only benefit the agent who offers them. If they don't sell the home, they are not going to buy the home for any price that a seller would or should accept. Agents are not going to sell your home for free after 60 days, unless they sell it themselves and the chances of that are extremely slim. Gimmicks are only a way for agents to get in the front door. 5.) 3% of the sales price is a lot of money, as is 4.5%, but it is always less than 6%. Do the math using a 6% fee. The savings on a $200,000 home is either $3000 or $6000. On a $400,000 home the savings are $6000.00 or $12,000. Why would you give your money away if you don't have to? You don't have to! 1. Price and Condition are the most important factors that will determine how quickly your home will sell. We do a market analysis to determine your value and review all the factors that will present your home in its best light. We even have professional stagers that will assist you if you desire. Our single objective is to sell your home for the highest price possibe in the shortest amount of time. 2. There are two major ways to market your home and these two ways account for over 99% of all sales. They are the MLS (Multiple Listing Service) and sign in the yard. But we do a lot more. We hold open houses because we know that open houses work. We do virtual tours, color graphics and because of REALTOR.com and other search engines we have a big presence on the internet. We do all of this while saving you a significant amount of money. 3. The bottom line: We are a full-service company with experienced agents (most of 3% agents have been in the business for more than 10 years) and we do all of this for a reduced fee! Don't pay those high fees, call us! 1.) The total commission is 3% of the sales price of which 1.5% is paid to the coop broker and 1.5% to 3% Real Estate. We have sold hundreds of homes with this plan and no matter what any real estate agent says, our homes get shown and sold at the same rate as any home. Remember, the agent does not control the market, buyer and sellers do, and buyers will always see our homes because of our open houses, our sign in yard, MLS, REALTOR.COM, and the internet. Don't do business with any agent who claims they don't show properties that pays them less than a 3% coop fee. They have violated their fiduciary to their client and that calls into question their ethics. 2.) The total Commission is 4.5% of the sales price of which 3 % is paid to the coop agent and 1.5% to 3% Real Estate. However, if the property is sold in-house, the commission reverts to a total of 3%. Some sellers have wanted to offer 3% to the other agent and that's fine, we understand. We have sold many properties on this plan and regardless of the plan you chose, you will still save a significant amount of money! And remember, if your home is sold by a 3% REALTOR who is working with the buyer, then your commission will be 3% instead of 4.5% of the sales price. What a deal!! Scheme # 1: If we don't sell your home, we will buy it. This is the latest and most prevalent marketing scheme out there. I doubt if any home has ever been bought by these agents. The only way that they will buy your home is at a very reduced price that no seller would accept. It is a ploy to get in the front door. Don't fall for it. Scheme # 2: Because of all the marketing I do, I have more buyers. The truth is only a small number of homes are sold by the listing agent. Marketing does work, I do it extensively, and we do sell some of our own listings, but I know that most of my listings will be sold by another agent through the MLS. When we sell your home and no other agency is involved, our fee is 3% total.